In the very early days of the blog, I decided to make a butternut squash pizza. I sent Ryan to the store to pick up a butternut squash and when we got ready to make our pizza, I discovered he had bought a spaghetti squash. My sister Julia was visiting--this was before she'd moved to St. Louis--and that evening will forever go down in history as one of my worst moments. Not only did I freak out on Ryan for purchasing the wrong squash, but when my sister started making fun of my ridiculousness, it led to one of our most epic fights. Three years later and I still get a little hostile when Julia or Ryan begins a sentence with, "Remember that time Ryan bought a spaghetti squash...". For the record, spaghetti squash tastes pretty weird on pizza. (Yes, we made do with the spaghetti squash) Butternut squash, on the other hand, is quite tasty!...especially when paired with caramelized onions, goat cheese, and spinach! 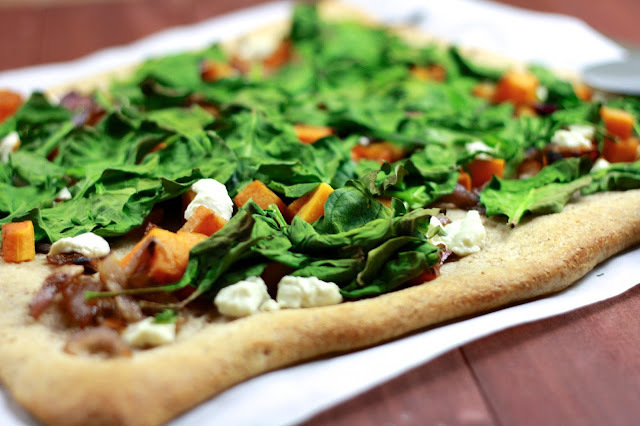 This is really more of a flatbread than a pizza. There's no sauce, although I recommend spreading some olive oil on the crust before you add the toppings. While we normally use homemade dough, I had some Pillsbury artisan dough leftover from the Snackadium and we were pleasantly surprised with how good it was! To make this a super quick meal, pre-roast your squash and caramelize your onions. Refrigerate overnight and then throw everything on the crust and bake! 1. Toss butternut squash with 1 tsp of olive oil. Season with salt and pepper. Place on a foil-lined baking sheet and roast at 400F for 25-35 minutes, stirring halfway through, until soft and lightly browned. Set aside. 2. Heat 1 tbsp olive oil in a large skillet over medium-high heat. Add the red onion and season with salt and pepper. Cook, stirring occasionally, for 20-30 minutes until browned and beginning to caramelize. 3. Preheat oven to 450F. Line a baking sheet with parchment paper and roll out pizza dough. Prebake for 10 minutes. Remove from oven and drizzle with olive oil. 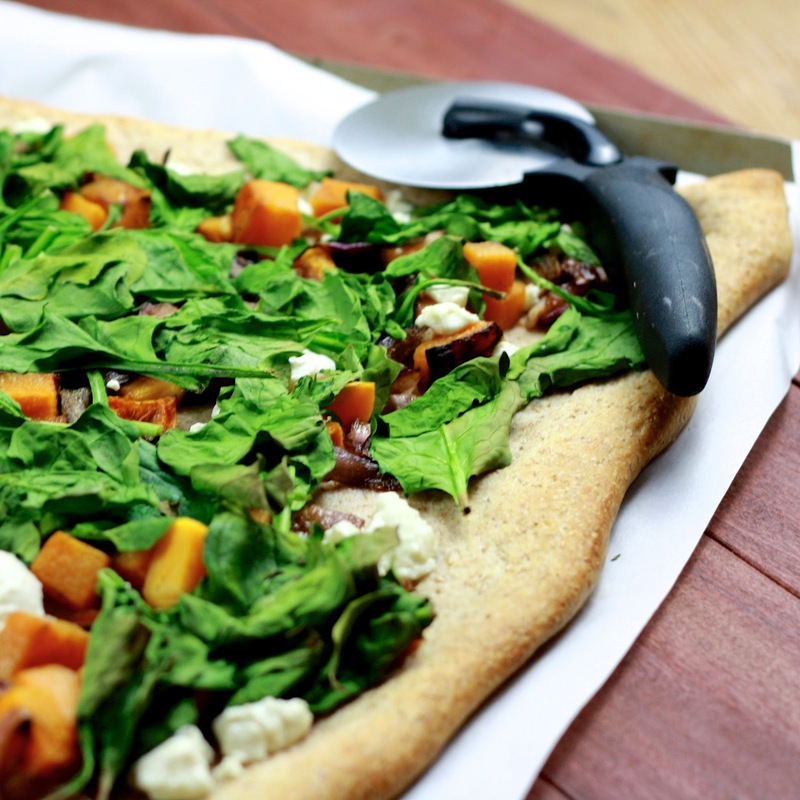 Top with squash, onions, spinach, and goat cheese. Sprinkle with dried thyme. Bake for an additional 10-15 minutes, until crust is crispy.